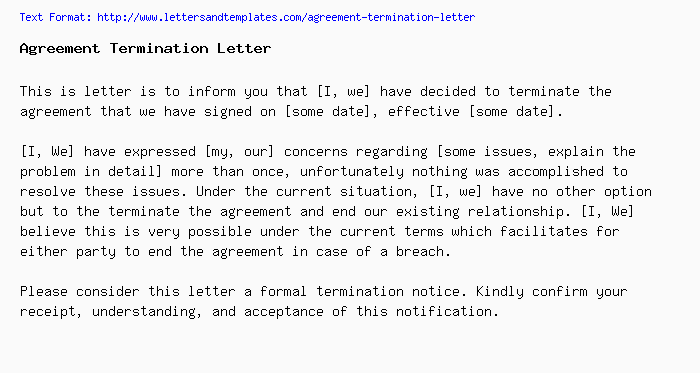 This is letter is to inform you that [I, we] have decided to terminate the agreement that we have signed on [some date], effective [some date]. [I, We] have expressed [my, our] concerns regarding [some issues, explain the problem in detail] more than once, unfortunately nothing was accomplished to resolve these issues. Under the current situation, [I, we] have no other option but to the terminate the agreement and end our existing relationship. [I, We] believe this is very possible under the current terms which facilitates for either party to end the agreement in case of a breach. Please consider this letter a formal termination notice. Kindly confirm your receipt, understanding, and acceptance of this notification.